Amidst the bubbling asymmetry of Neon Indian’s first two albums, there are moments of remarkable clarity. The nostalgic haze of Psychic Chasms and the 8-bit grime of Era Extraña showed the promise of Alan Palomo’s vision for Neon Indian but these albums managed only an intermittent fulfillment of that promise. Surrounding the triumph of “Deadbeat Summer”, “Should Have Taken Acid With You” and “Polish Girl”, are sloppy amorphous interludes that seem more like studio experiments than intentionally constructed songs. Palomo has lingered on the fringes of alternative electronic music since his 2009 debut but, with the release of his third LP VEGA Intl. Night School, Neon Indian finally sounds ready for mass consumption. Despite starting with a syrupy instrumental intro track, VEGA Intl. 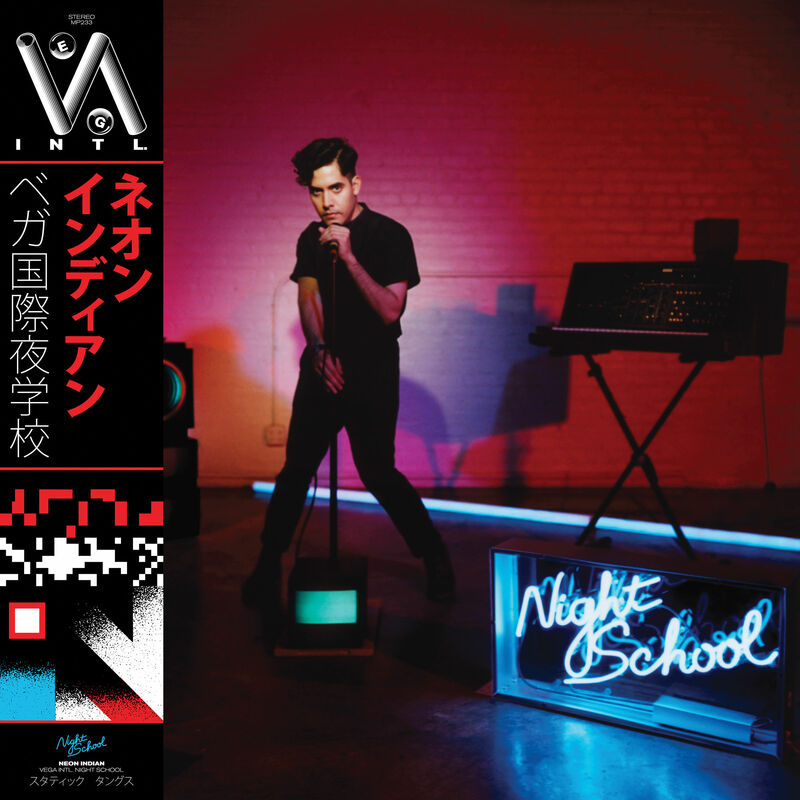 Night School is a far more structured album than either of Neon Indian’s previous releases. Following the overture-ish “Hit Parade”, the lead single “Annie” bursts into a jittery electro-funk track that recalls the synthesizer sounds that defined his first two albums but with more clarity and purpose. After tinkering with studio toys for the last half-decade, Neon Indian has figured out how to apply his signature style with lucidity. Psychic Chasms and Era Extrana struggled to balance experimentation and composition but these opposing forces move in harmony on this record. VEGA Intl. Night School sounds accessible enough to draw in a wider audience without sacrificing any of Neon Indian’s strangeness. VEGA Intl. Night School has incredible artwork. The brash pompousness of Alan Palomo’s staged action shot has a silly coolness to it. There is a lot happening: the corporate VEGA Intl. logo, the mysterious Asian characters, the futuristic barcode thingy and the glorious neon ‘Night School’ sign. Inside the gatefold LP, abstract artifacts of vice cascade across the centerfold. When paired with the visual aesthetic of the artwork, VEGA Intl. Night School’s retro-futurism vibe comes to life in a fabulously enjoyable way. The whole thing reminds me of the dark globalism of Ridley Scott’s Blade Runner; it’s bright but seedy, futuristic but analog. The aesthetic of VEGA Intl. Night School doesn’t show us the future as it has been delivered, but as it was once imagined and as evidenced the current obsession with Back to the Future II, there is a nostalgic charm about obsolete visions of the future. Palomo incorporates a wider variety of pop influences on VEGA Intl. Night School and the chemical reaction of sounds is as intriguing as it is infectious. “Glitzy Hive” and “C’est la vie (Say the Casualties! )” both sound like Daft Punk remixes of Prince songs and it’s every bit as fulfilling as you might imagine. The closing track, “News From The Sun (Live Bootleg)” sounds like a Prince song straight up. On the opposite end of the spectrum, “Baby’s Eyes” has the synthy mid tempo strangeness of a sparse Pink Floyd track with its steady percussive stomp and heavily filtered guitar solos. At the center of the album is the two-part opus of “Slumlord” and “Slumlord’s Re-lease”. Driven by a heavy bass funk, crystalline synth arpeggios and an M83ish grandeur, “Slumlord/Slumlord’s Re-lease” represent the majestically grimy heart of VEGA Intl. Night School and they lead directly into satisfyingly club-ready “Techno Clique”. Despite the variety, VEGA has an unwavering sense of purpose and cohesion throughout the twists and turns. It seems trite to suggest that an album ‘will take you on a journey’, but VEGA Intl. Night School does exactly that. Alan Palomo has made his best record to date and it will certainly rank among Compact Discograpy’s best albums of the year. With VEGA Intl. Night School, he has found a way to make Neon Indian’s music a more tangibly accessible product without compromising on what made Neon Indian so interesting in the first place. VEGA Intl. Night School is an energetic, weird and undeniably cool record that you shouldn’t miss.